One of the biggest issues with content creation and marketing campaigns is the lack of a proper internal linking strategy. Every site should run an internal linking audit at least every quarter. Internal linking is a sound strategy for improving search rankings and is something that very few sites execute effectively. Here are some of the key functions and benefits of a proper internal linking strategy. A proper internal linking strategy will open direct pathways for search engines to discover pages lower down the site-structure. Sometimes it might take at least seven levels of links to get to a page. With proper internal links, you can elevate a page and guarantee search engine visibility. Proper internal links also help organize web pages properly. When you link internally, you identify specific anchor text and phrases throughout the site and then link to the page. 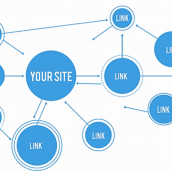 This linking helps both site visitors and search engines. You can also rank lower pages higher in the search engine results by passing link equity from one page to another. For example, an about page of a site has a lot of link equity. A lot of that equity is because it is a first-level page and smart linking from that page will pass equity to other pages that need it more. One thing to remember is that links in pages that disavowed are in your robots.txt will not count, nor will links in Flash, Video and other embedded content.